How has the experience of training there been, from first course to now? 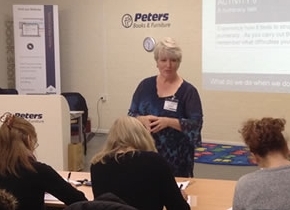 I first visited Peters Books to present an introductory session in April 2014 and have now had the true pleasure of delivering five back-to-back training events to date. Some 200+ trainees have accessed training in Birmingham so far. The venue is superb, well located and incredibly supportive of Catch Up® as an organisation and of all the people (myself included) who visit. The relationship which has developed between Peters Books and Catch Up® has meant that I, as a trainer, can just relax and share the Catch Up® message…..the venue takes every care of each visitor, ensuring they are comfortable, welcomed and valued. What is the experience like for trainees? Is there anything else you’d like to tell us about your experience of training at your Regional Training Centre? I cannot over-emphasise the success of this RTC, which is due in no small part to the teamwork approach of Catch Up® and Peters Books. Our core values are well represented here, with staff from Peters attending Catch Up® training to ensure they have the ‘right message’ and share the passion for books, people and literacy.